iiiDrops is out May 27. 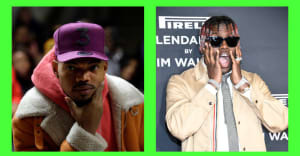 Both rappers are looking for a woman companion, but their preferences couldn't be more different: Joey's on the prowl for girls with the credit cards and the high heels/ the Mercedes Benz with the big wheels, while Chance is a manic pixie dream girl kind of guy, Where are the girls at with the book in the club/ With the reading glasses on getting shook in the club/ Reading Ta-Nehisi Coates, something SpottieOttieDope/ With the 'Why I let them drag me here?' look in the club. Listen below.